I absolutely loved Warren's Governor-General's Award winning novel, Cool Water. So I was very pleased to see this book when it was published, even though it took me a little while to actually read & review it. 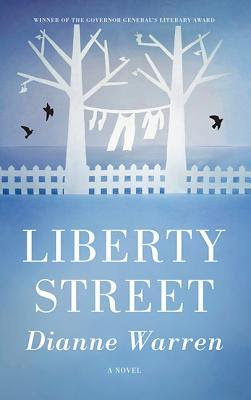 Liberty Street is a bit different from the last one; it also takes place in Western Canada but this time Warren focuses mainly on one character, Frances Moon. It's set in the very recent past, starting in the past decade as 50-something Frances blurts out a secret to her partner of 20 years -- she had & lost a baby at 19, and she's probably still married to the man she'd married then. Her partner understandably leaves in shock, and Frances returns to her hometown, the small town of Elliot, Saskatchewan, to revisit those things she'd hidden for so long. We then discover via flashback Frances' life in Elliot from her childhood on up. We meet many side characters who have affected Frances and made her what she is -- her parents, teachers, neighbours, renters of her family's house on Liberty Street, and perhaps most powerful for her, Dooley Sullivan, a rebel with whom she went to school. He's so important that we learn his story interwoven with Frances', and unlike any of the other characters he gets a whole chapter from his POV. Unfortunately, I felt that this didn't fit with the overall book, and wonder if perhaps my satisfaction with this novel would have been higher if it had been a collection of interlinked short stories, with more character variety. I just found Frances a little dull and the antithesis of proactive. She drifts, lets things happen around and to her, and only discovers now, rather late in life, both that she can perhaps have a little agency in her own life, and that she is not unlike other human beings in her life choices. As usual with Warren's books, the writing is very fine, very polished and has lots to admire about it. The setting is beautifully and realistically drawn; she knows Saskatchewan & evokes it fully. But even for literary fiction this one is slow moving, and I didn't really feel that anyone gained any resolution by the end -- not Dooley, not the family of a wronged man Frances knew as a child, and certainly not Frances herself. It just didn't satisfy my readerly curiosity in the end. So while this is a good read, I'd recommend Cool Water first, if you're looking for a great read. This novel reminds me of a few other Western Canada set novels I've read in the somewhat recent past, for their focus on families & growth in women's lives. I'd suggest you might want to check out Blue Becomes You by Bettina von Kampen for another woman of a certain age resolving her disappointments about the past, or Jacqueline Baker's A Hard Witching for short stories set in the same region. Thank you for sharing your thoughts about this book. Cool Water is going on my wishlist! It is a really good read! I think you would like it. I really liked Cool Water, but kind of forgot about checking out anything new by her. I will have to remedy that! I think this is the only book newer, but there are her short stories as well. All good!